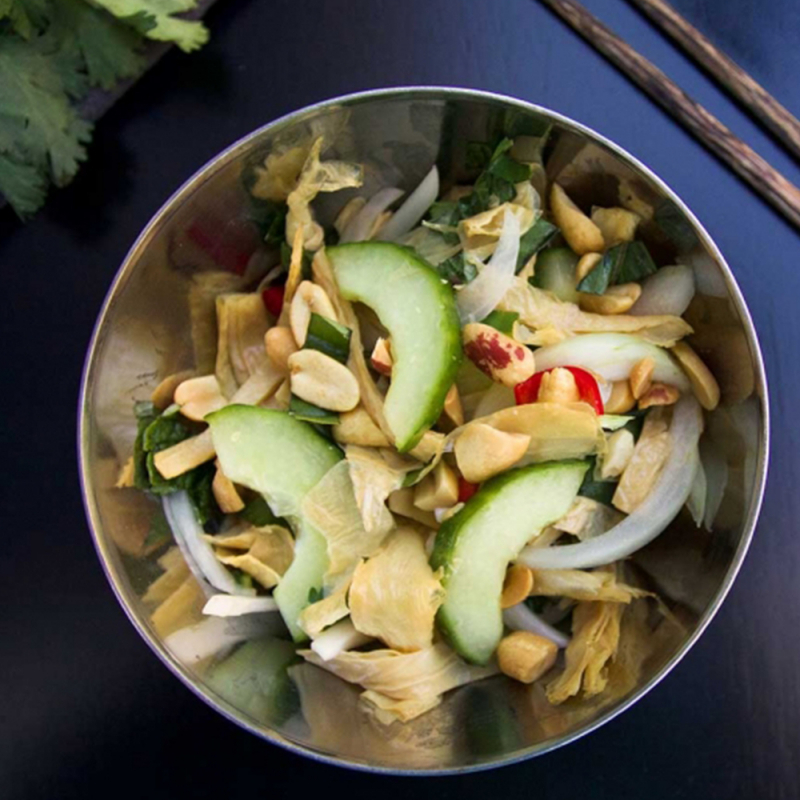 This post about Cameron Stauch’s book, Vegetarian Viet Nam, and his cucumber and shredded tofu skin salad does not contain affiliate links. Fridays are a big day in our house. They don’t just signal the weekend has arrived. Around these parts, Fridays are known affectionately as Mama-Baby Days — a day of precious family time. When I left corporate life nearly three years ago, I did it to have more time with my daughter. Fridays, I decided, would involve minimal work and maximum time together. Our Fridays for the past year have included mornings at an activity group followed by lunch at the nearby pho joint. Our order is always the same: I get a small bowl of the vegetarian pho with extra noodles to share with a child who loves slurpy things. She gets a plate of deep-fried tofu washed down with a strawberry bubble tea. If I’m feeling really indulgent, I’ll forgo the bottomless free green tea for a fresh lime juice. Or server, Vincent, knows us by our names and order, so in those rare moments we divert from routine, he feels compelled to check that we didn’t make a mistake or forget something. Sometimes, he’ll be the one to encourage a break from the usual by suggesting a on-off menu beverage or a different sauce combo to amp up our meals. I love those lunches, especially as a vegetarian. My offerings are a fraction of the meaty choices on the menu but Vietnamese food, with its emphasis on fresh ingredients and the five tastes, checks all the proverbial boxes for me. So it wasn’t a hard sell to be wooed and wowed by Vegetarian Viet Nam, the new cookbook by Canadian ex-pat Cameron Stauch. Unlike that tome of a menu at our pho haunt, everything in this book by the Stratford Chefs School alumnus is fair game for me to eat. So much about this book stands out beyond the fact I can enjoy all the recipes, which, save for a handful containing egg, are predominantly vegan. I love the photojournalistic nature of the images, showing street vendors with their wares and other slice-of-Vietnamese-life moments. There aren’t photos with every recipe but those that are included feature sharp portraiture that feels so in the moment, I want to dive into the page. Eye candy aside, this book is incredibly well-researched. It’s a trait that stems from Stauch’s own trials and tribulations as a foreigner trying to navigate Vietnam’s food scene to feed vegetarian family members. Stauch, whose wife Ayesha worked as a political counsellor at the Canadian Embassy in Hanoi, was already well-versed in alternative or restricted diets. He spent six years cooking for the Governor General, helping to prepare family meals and state dinners that represented Canada and considered the flavours of visiting nations, along with dietary needs. In 2012 when he moved to Vietnam, Stauch expanded his prowess in the kitchen through sampling and researching vegetarian street food, and learning how to combine ingredients, such as seaweed and tofu, to create “meaty” flavours. His professional background gives him the chops to write a cookbook, but it’s those recent memories of being a “student” overseas that keep the recipes in Vegetarian Viet Nam accessible to cooks of all skill levels. Cameron Stauch, Photo by Matthew Dakin. I love this book because Stauch gives credit where it’s due: to the people of Vietnam who gave him the knowledge necessary to pen an authoritative volume that feels like an instant classic. Vegetarian Viet Nam, with its contextual look at food history in the Southeast Asian nation, belongs in a category alongside Naomi Duguid and Jeffrey Alford’s books that are as much a study in anthropology as cookery. Touches including a glossary of ingredients that aren’t typical to everyday Canadian supermarkets make this book incredibly user-friendly. Stauch takes into account that not everyone has access to Vietnamese or Asian grocers, so he offers alternative ingredients where possible. Cilantro, mint and Thai basil work well in place of Vietnamese coriander when you live in St. Catharines, Ont., and the only (incredibly well-stocked) Asian grocery store doesn’t have room to sell everything I might need to make Stauch’s life-affirming cucumber and shredded tofu skin salad. The Vegetarian Vietnamese Pantry chapter is a compendium of how-to’s for basics to keep handy when you need to satisfy banh mi or pho cravings. Those staples will also help with dishes readers may be less familiar with, including stir-fried romaine lettuce with tomatoes and peanuts (rau diep tao ca chia dau phong) or stewed jackfruit with Vietnamese coriander (mit kho). In addition, Stauch’s sample menus prove home-cooked Vietnamese food can easily become part of the regular dinner rotation. I look forward to many of his recipes staples in our house this summer, especially with the abundance of the growing season to come. If only the book came with a Vincent for the camaraderie. But Stauch’s conversational tone and friendly advice throughout make him a most suitable stand-in. Place the tofu skin sticks in a casserole dish (snap them, keeping them long lengths, if too long for the dish). Fill the dish with hot water and lay a small-mesh rack or a large stainless-steel spoon (something that won't float) across them to keep them submerged. Quick Soak Method: Place the casserole dish in a 200°F (95°C) over for 1 to 1 1/2 hours. Long Soak Method: Or soak at room temperature for at least 8 hours before you plan to prepare the salad. The tofu skin sticks are ready when they are a lighter colour and there are no dried parts at the core of the sticks when you cut through them. Drain, cut off and discard any tough parts (this tends to be the thin curved part at one end that touched the stick or rack wehn drying) Cut the sticks into 2-inch (5 centimetre) lengths. Gently squeeze out any excess water and pat dry with a clean dish towel. Pull apart into shreds or cut three or four times lengthwise — if using looser tofu skin sticks, tear them into about 1/4-inch-wide (6 millimetre) strips — and place in a small bowl. You should have about 3/4 cup. Toss with the soy sauce. Soak the onion in a bowl of ice water for 10 minutes. Cut the cucumber in half lengthwise. Use a small spoon to scrape out and discard the seeds. Cut on a diagonal into 1/4-inch (6 millimetre) slices and place in a large bowl. Or slice small cucumbers crosswise into 1/4-inch (6 millimetre) coins. In a small bowl, mix together the rice vinegar, sugar, oil, and salt. Stir to fully dissolve the sugar. Drain the onions and press lightly with the towel to remove any excess moisture. Add to the cucumber along with the tofu skin stirps, Vietnamese coriander, and chile. Pour the dressing over the salad and toss well. Mound the salad onto a serving dish and sprinkle black pepper and peanuts over the top. Replace the tofu strips with bite-sized pieces of 1/2 pound (225 grams) trimmed oyster mushrooms. Cook the mushrooms in a tablespoons of vegetable oil over medium-high heat for a couple of minutes, stirring occasionally to colour lightly before adding the soy sauce. Cool before mixing with the rest of the ingredients. This recipe gives the option of using Stauch's make-ahead Fragrant Shallot Oil. For ease, I used the neutral vegetable oil option instead. I used dried bean curd sticks in this recipe and found that when hydrated, three feet provided me with more than 3/4 of a cup of shredded tofu, so I doubled my version of this recipe and it worked without problem. As an alternative to Vietnamese coriander, I used equal parts cilantro, mint and Thai or Asian basil. I used a seeded pencil pepper as my mild chile pepper, but it was a risk. Of all the peppers, these can range from mild to fiery hot.